"Cloud, you already look like a girl. Why are you so annoyed about dressing like one?" "I told you I could make you blush, Mr. I've-never-been-embarrassed!" Said my girlfriend. "I think its the diapers more than the dress." i replied, smiling slyly. She was so cute when she wins something. "Why did you make me wear them by the way?" "Two reasons, firstly because I knew they'd make you blush, secondly so I could lock you in them and make you do stuff for me!" She smiled. "W-What do you mean?" i asked, slightly scared. "You know exactly what I mean, sissy boy! Now try on this blue one, or no key until tomorrow!" 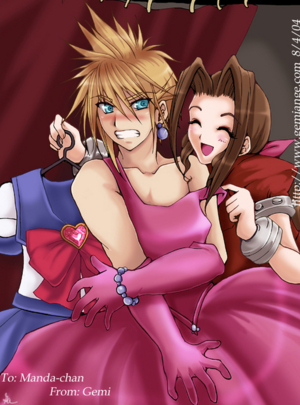 I would add some kind spell to make Cloud become a sissy, or possibly a sissy baby girl names Claudia.